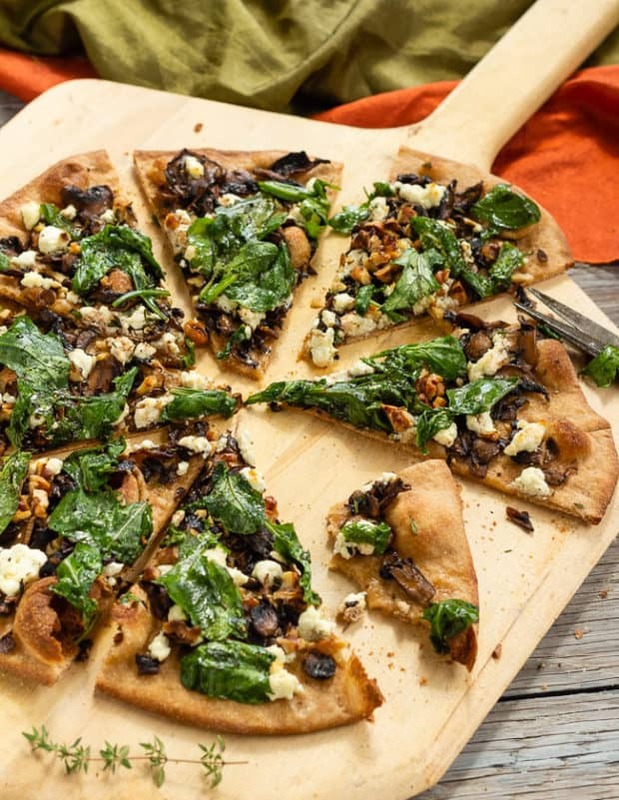 This week, while magazines, newspapers, food bloggers, and Pinterest arm us with Thanksgiving recipes, we’re going afield with homemade pizza, caramelized mushroom arugula pizza bianca! 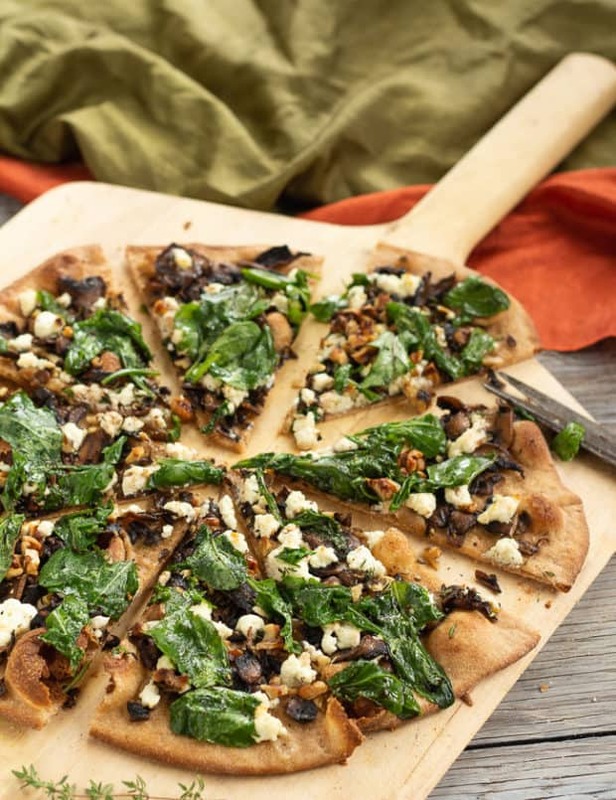 Who can resist an eatable platter, like a thin crispy whole wheat crust, topped with golden-sautéed mushrooms, fresh goat cheese, crunchy walnuts, garlicky olive oil, and a tangle of peppery arugula? Did you notice I didn’t say anything about tomatoes? Right, nary a tomato in sight on this pizza. In pizza talk, when pizza isn’t topped with tomato sauce or tomatoes, it’s a “white” pizza, in Italian, pizza bianca. 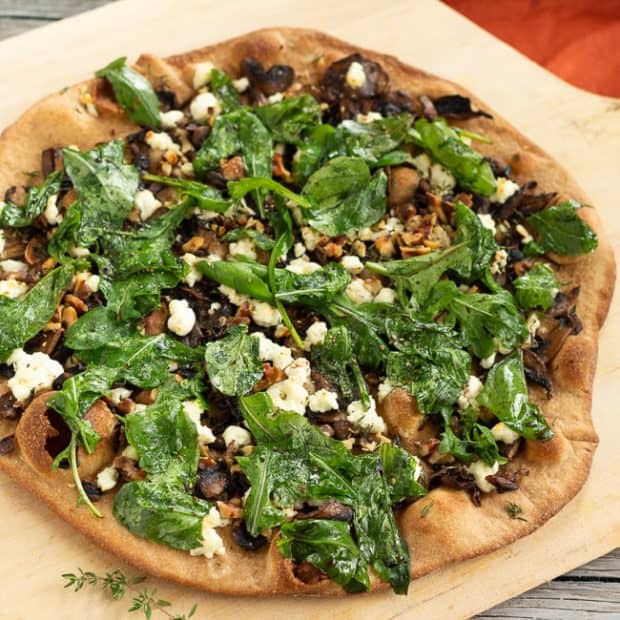 CLICK HERE to PIN Caramelized Mushroom, Arugula, and Goat Cheese Pizza! Not on purpose, it just seems to happen that way– the homemade vegetarian pizzas that come from my oven are everything besides tomato-sauced. Pizza bianca. 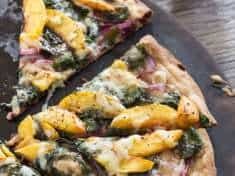 Pizza around here could be thinly sliced potatoes on top of basil pesto, or tangy-sweet summer peaches with arugula, or caramelized onions and fontina cheese, and ever so rarely, tomatoes. I’m just a pizza bianca kind of gal. Mushroom arugula pizza bianca is a mutual admiration pizza. Like children who play well with others, this pizza’s toppings have fun together. 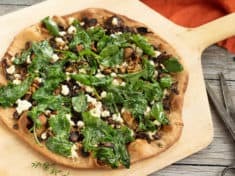 As in, slightly bitter walnuts play perfectly with peppery arugula, aromatic garlic complements caramelized mushrooms, balsamic vinegar highlights arugula, and those crunchy walnuts and mildly tangy goat cheese, well, that’s flavor affinity! Not to mention the finishing sprinkle of pungent thyme accenting each and every other ingredient. Can you taste what I’m saying? While it’s not as easy as ordering on the phone, what comes from your oven is above and beyond what comes in a box. And a whole lot more fun—pizza is a party in the making! Knowing how to make and bake pizza is a culinary trick you want up your sleeve. Caramelized mushroom and arugula pizza bianca. One slice of this tasty homemade pizza and you’ll be with me on the bianca bandwagon. Promise. *** Just so you know, some of the links below are affiliates. When you purchase products via my links, it doesn’t cost you anything and I earn a tiny commission, which helps me continue to provide free content here on Letty’s Kitchen. Thank you!! What kind of crust can you use for pizza bianca? What if you don’t have time to make a homemade crust? You can bake your caramelized mushroom and arugula pizza bianca on just about any bottom crust you please. 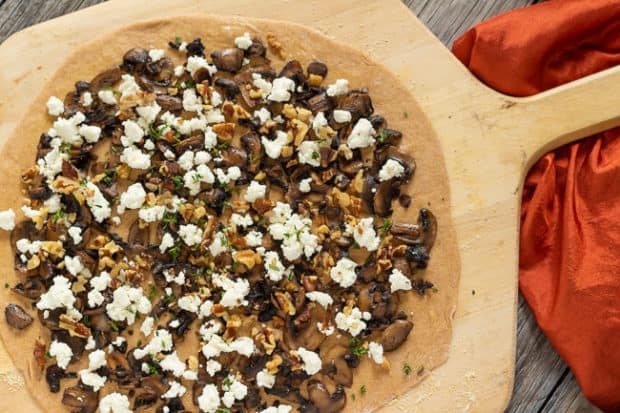 At our house we roll with thin and crispy nutty whole wheat pizza dough, a stellar dough that’s easy to make and prepare ahead, yet fast-rising enough to be ready to use in an hour. If you want to roll your own but don’t want to mess with yeast, ask for fresh dough at your favorite bread bakery. Look for rolled and ready pizza dough in grocery store freezer cases. They sell ready-to-top pizza crusts with clean-eating ingredients at both Whole Foods and Trader Joe’s. If avoid gluten, give a cauliflower crust a try. Costco carries a cauliflower crust that’s ready to top and bake. Simple Mills sells a boxed gluten-free pizza dough mix. Another option is to build your pizza on pre-baked flatbread, like the naan bread from Stone Fired Oven. Can you substitute a different cheese? Yes! You might want to try a mix of melty fresh mozzarella and salty feta. Blue cheese like Gorgonzola also has excellent flavor affinity for mushrooms, arugula, and walnuts. For a vegan pizza, mix a little fruity olive oil into the “cheese” and let it sit a few minutes before topping the pizza. Do I need a pizza stone and peel to make pizza? No. Don’t let want of equipment keep you from homemade pizza. Granted, a wooden or metal peel helps slide pizza in and out of the oven, and a hot pizza stone yields a quickly baked crisp crust, but you can build and bake pizza quite easily on a cookie sheet or round pizza pan. However you build your pizza, be sure to sprinkle cornmeal on the pan or peel before placing the rolled dough. The cornmeal acts as ball-bearings so the crust doesn’t stick to the pan and slides easily onto the stone. If you have a pizza stone but no peel, build your pizza on an upside down cookie sheet that you’ve sprinkled with cornmeal, and use it to slide your pizza onto the stone. What’s the easiest way to cut pizza? With scissors. They’re much more up to the task than any pizza wheel. Those in the know: At Nostrana in Portland Oregon they give you scissors with your uncut pizza! Happy Thanksgiving! I’m grateful and honored you found me in this little corner of the world wide web. To you, dear readers and subscribers, thank you! Peruse my Pinterest boards for more vegetarian recipe ideas. I have one board devoted just to vegetarian and vegan pizzas! You might also like how caramelized mushrooms enhance this spicy red lentil mushroom pasta. **Adapted from a NY Times article by Martha Rose Shulman, who wrote several cookbooks that grace my cookbook shelves, The Vegetarian Feast and Fast Vegetarian Feasts. Make the dough and let it rise 8 hours the fridge. Or make the dough and sauté the mushrooms, chop the fresh thyme, toast and chop the walnuts, and season the arugula while the dough is rising. Makes 2 (11-inch) pizzas. Cut each pizza in 8 to 10 wedges. Whole Wheat Pizza Dough or your choice of pizza crust. Preheat the oven to 450 degrees. If you have a baking stone, place it on the middle oven rack. For the garlic oil, stir the minced garlic into the olive oil. Set aside. Cook the mushrooms: Heat a large skillet (ideally 12-inch cast iron) on medium-high flame. Add the first 2 tablespoons olive oil and swirl it around the hot pan. Add the sliced mushrooms and sauté, stirring often. As the mushrooms cook, they will release liquid and the liquid will evaporate. Sauté until the mushrooms have shrunk in volume and take on a rich golden-brown color, 10 to 15 minutes. Stir in the first 2 teaspoons of thyme leaves and season with salt and freshly ground pepper. Set aside. While the mushrooms cook, toss the arugula with the vinegar, the remaining 2 teaspoons olive oil, and pinches of salt and pepper. Set aside. Sprinkle a wooden pizza peel or rimless baking sheet with cornmeal. The cornmeal acts as ball-bearings so the crust slides easily onto the stone. If you don’t have a pizza stone, sprinkle the cornmeal on the bottom side of a baking sheet. Divide the dough in 2 portions. On a lightly floured surface, roll the first portion into a 13-inch round. 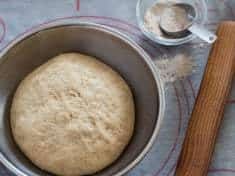 Transfer the dough to the wooden peel or the upside-down baking sheet, or if you don’t have a pizza peel or stone, place the rolled dough on a cornmeal dusted pizza pan or baking sheet. Brush the dough generously with half of the garlic oil. Scatter half of the cooked mushrooms over the top, leaving a 1-inch border. Distribute half of the goat cheese followed by half of the walnuts. Grind a couple turns of black pepper, sprinkle lightly with salt, and sprinkle with half of the remaining thyme leaves. If you are using the wooden peel or upside-down baking sheet, slide the pizza onto the preheated baking stone. Lacking a wooden peel or stone, use a pizza pan or baking sheet and put the pizza directly in the oven. Bake 7 to 10 minutes, until the crust is light brown and cooked on the bottom side. (see note) Scatter half of the dressed arugula over the pizza and return to the oven another minute to wilt the arugula. Use the pizza peel to slide the pizza from the stone and onto a serving platter. Repeat with the 2nd portion of dough, using the remaining ingredients. One pound mushrooms seems like a huge amount, but they shrink dramatically as they cook. Pizza baked on a metal pan will take longer to bake than a pizza baked on a hot ceramic pizza stone.